Chairman Shimoji and Rep. Dir. 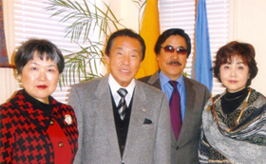 Tokuda visited to the NY United Nations head office and met with Mr. Lhatu Wangchuk, Permanent Representative of the Kingdom of Bhutan. This was the second time to visit him in UN. They talked together about the future cooperation of both of countries, Bhutan and Japan. 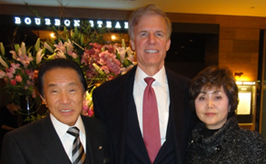 In Washington DC, JEPA Boards met with Mr. Shimoji’s longtime friend, Mr. Ryan. He was the one of the most closest aides of the President Reagan. 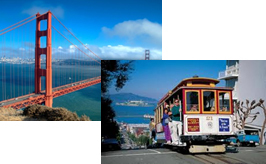 They also visited to San Francisco to study the Japanese enterprises for JEPA members who want to launch into the market in San Francisco. 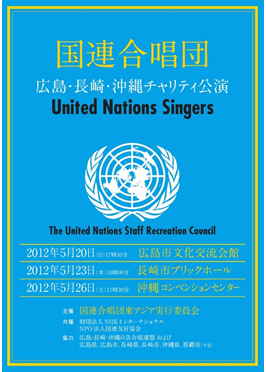 This performance will be done to remember atom bomb victims of Hiroshima and Nagasaki and victims of the war in Okinawa. The black-and-white drawing which drown a dragon is donated to the HM the King of Bhutan. 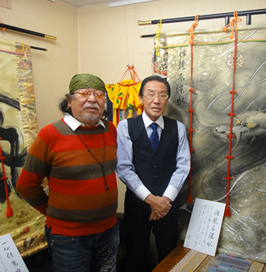 Mr. Shioya, painter in Kyoto, drew the dragon. Dragon appear on the Bhutan’s national flag. Mr. Shioya was touched very much by a speech of HM the King during his state visit to Japan in last November. 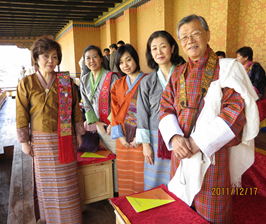 Tour organized by Ms. Tokuda, Honorary Consul-General of Bhutan in Japan, visited Bhutan in last December. They were welcomed very much in Bhutan. They were so moved and felt honored to meet with HM the King. 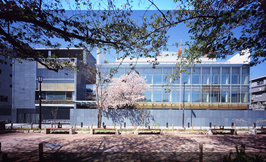 In April 26, 2012, JEPA sponsored the Forum with the cooperation of the Embassy of India. Thanks to the HE Ambassador and HE Minister of the Embassy of India, the Forum was a great success.